Badger Varsity Football (2-2) will regroup and play Gatesville on Friday 928 in Badger Stadium. It will be the Badger Homecoming game. The kickoff will be at 7:30pm. About Gatesville...they are 1-3 so far after last week’s loss to Waco Connally 17-7. They also lost to Cameron and Midlothian, but beat Robinson. They are #71 in Division 4A-1 while Lampasas is #62. They want a win, and are probably better than their record suggests, but so it is with Lampasas. It should be a good Homecoming Game. Badger 9th and JV teams will be at Gatesville on Thursday 9/27. LMS football will be at home on Thursday 9/27 against Gatesville with 4:30pm rolling starts for 7th and 8th grade. 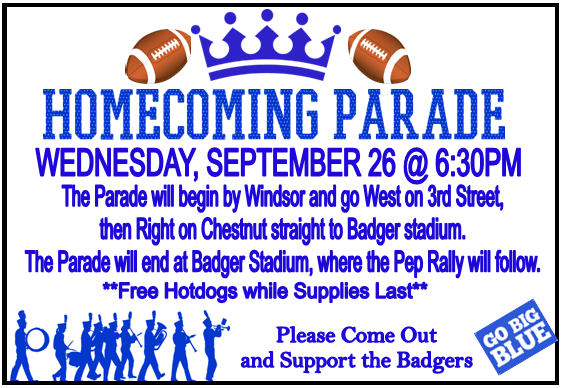 The Homecoming Parade and Pep Rally will take place Wednesday 9/26, lining up at 5:30 at 3rd and Elm, and beginning at 6:30pm downtown on the square. Canyon Lake is 4-0 after beating Smithville Friday and is rated number 5 in Division 4A-1. Liberty Hill is 3-1 after an 89-34 runup win over Pflugerville Connally. LH is #27 in 4A-1. Fredericksburg is 3-1 after a 46-20 win over Wimberley and is #28 in 4A-1. Taylor is 2-2 after a 35-25 win over Salado. They are #61in 4A-1. Burnet is 1-3 after losing 46-0 in another runup game to Manor. Burnet is 4A-1 #70. Badger Tennis will host Ellison Tuesday 9/25 at 4pm. On Friday 9/28, the team will head to Belton with a 4pm start. 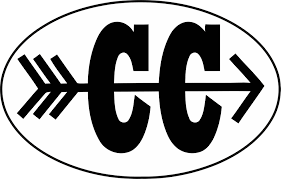 Badger Varsity Cross Country will be at Georgetown’s Old Settler’s Park on Saturday for an 11am run hosted by McNeil High. LMS Cross Country will be at Marble Falls HS on Wednesday 9/26 with a 4:30pm start. The Varsity, 9th and JV teams played Salado Friday in their district opener. The Varsity Team played close in the first two sets but were bested by the Salado girls 22-25, 20-25 and 7-25 in the series and start district 0-1. Top performers for the Badgers were Sena Kucukkarca with 6 Kills and 7 Assists, Juliana Dwamena with a solo Block, Megan Bobo with 4 Aces and Brooklynne Edgar with 10 Digs. The series had begun with a big win by the 9th team, taking the match in straight sets 25-16, 25-22. The JV team lost in straights sets, 8-25 and 17-25. Badger Volleyball will be at home on Tuesday 9/25 against Liberty Hill in their second district game with games at 5 and 6pm. On Friday, 9/28, the teams will host Taylor.